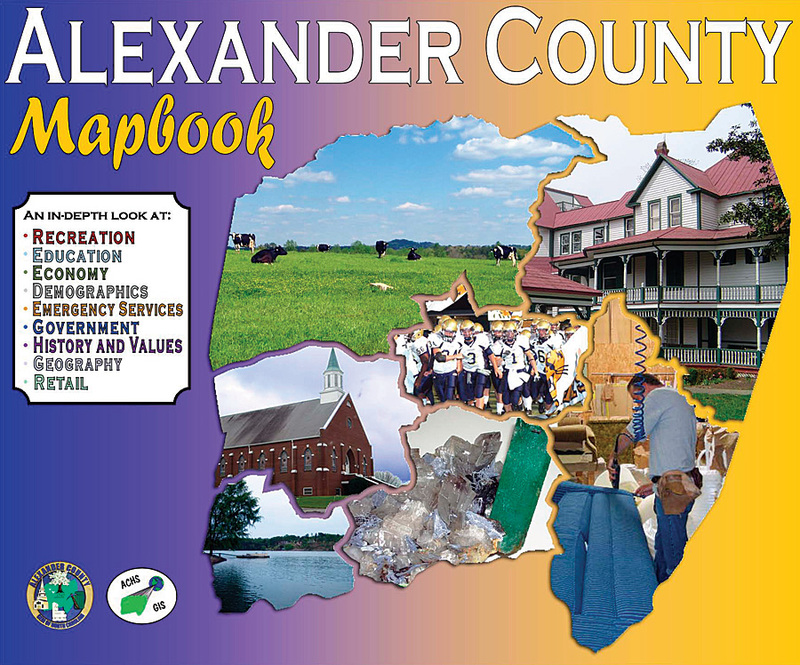 The Alexander County Mapbook contains information on all aspects of county business, government, recreation, retail, industry, and history. In these pages is an honest reflection of the small town atmosphere that is Alexander County. 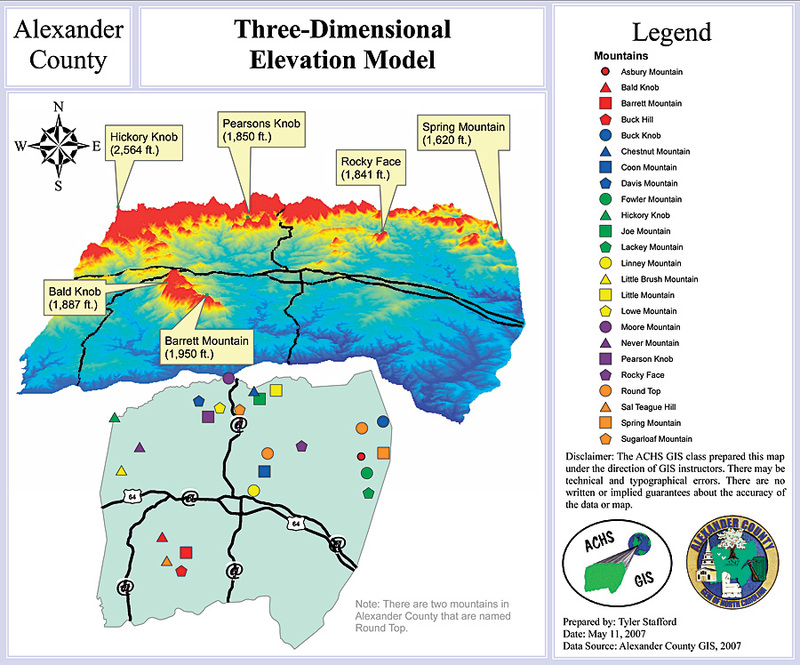 During the 20062007 school year in Taylorsville, North Carolina, the Alexander County GIS and Alexander Central High School GIS class embarked on a joint project to create and publish an informative, full-color map atlas of Alexander County. The GIS instructor, Eric Walker, initiated the idea of helping the county do some projects. From there, things moved pretty quickly. 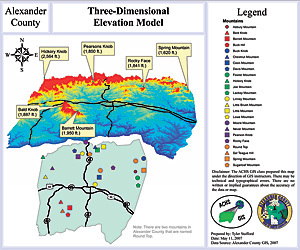 Alexander County donated six computers to the class, and Esri provided 12 one-year evaluation copies of ArcView with three extensions for each. Adding this to their existing computer base gave the students enough to get started. The county covered the cost of publishing the 160-page mapbook using ArcView and Microsoft Publisher and fees for Library of Congress, ISBN, and UPC codes. The students did the research and data collection and generated all the maps. In 12 weeks, they collected, designed, formatted, and assembled the publication on their own and later appeared before the county commissioners and county manager with a progress report on the book. Walker trained the students in the use of the software and served in an advisory position. George D. Brown acted as an advisor and the editor. 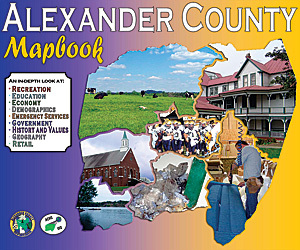 The book contains information on all aspects of Alexander County life and is divided into sections, such as economic development, arts and recreation, retail, history, emergency services, and demographics. The book will be placed in the county as well as the school libraries and will be available for purchase from several county locations as well. The County Economic Development department now uses the book as a tool for prospective business relocations. "This is an amazing feat considering there were only 15 students in the class and half of them were using ArcView for the first time," says Walker. "This book is proof that with the proper technology and motivated students, even a small rural county like Alexander can achieve amazing results. We hope this encourages other counties to undertake projects with their schools to bring GIS into more high schools across the country. Almost every aspect of daily life uses some form of GIS, and getting students interested can only result in more creative uses and applications of GIS in daily life." The North Carolina Association of commissioners awarded the project with its Outstanding County Program Award. For more information, contact George D. Brown, GIS/addressing coordinator, Alexander County GIS (e-mail: gbrown@alexandercountync.gov, tel. : 828-635-3024).